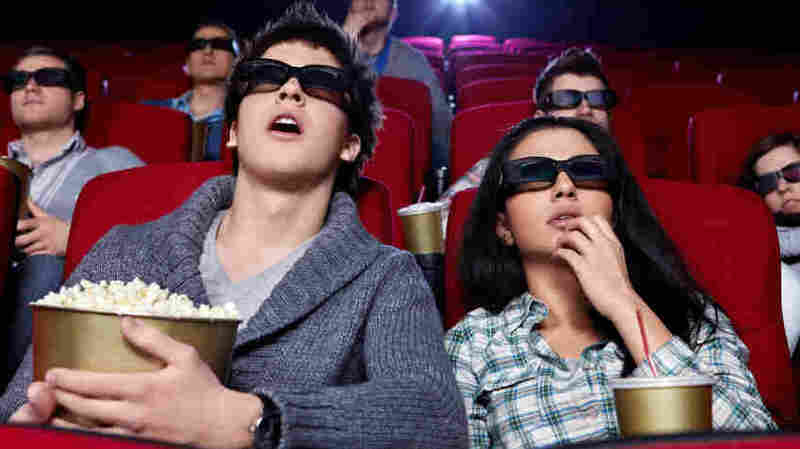 Could Paying For Glasses Nudge Moviegoers To Quit 3-D? Sony no longer wants to subsidize the cost of 3-D glasses. Believe it or not, that means the price of going to a 3-D movie could go up at just the moment when consumers seem to be showing some resistance to the costly technology. Could Paying For Glasses Give Moviegoers The Nudge They Need To Quit 3-D? Slate recently analyzed the fortunes of 3-D movies in the post-Avatar era and revealed that 3-D is a less and less lucrative enterprise. "If the medium isn't dead," Daniel Engber mused in a piece called "Who Killed 3-D? ", "it's mortally wounded." While Will Leitch has argued pretty persuasively at Yahoo! 's Projector blog that it's a bit early to call time of death, 3-D is certainly not looking like the boon to the industry some saw even two years ago. And now, with moviegoers more and more picky about which films they want to pay $3 or $4 to see in 3-D, Sony has notified theaters that it will no longer subsidize the cost of the plastic glasses. Theaters are fighting back, but Sony doesn't seem to be persuaded. That's right — believe it or not, while you were paying $15 for a 3-D ticket, that wasn't meant to cover the glasses. The studios were spending millions of dollars to provide the glasses themselves, and it still cost you $3 or $4 extra. Now, Sony says that's over. Beginning with next summer's Men In Black III and The Amazing Spider-Man, they want you to buy your own glasses on top of the price of your ticket. This isn't unheard of, by any means — it's how they do it in Europe. You pay for a pair of glasses, and then you can bring them back and not have to pay for them again. There's an environmental argument for this model, since not all the glasses people pay for now make it into those recycling bins, and of the ones that don't, plenty are undoubtedly thrown out. It also feels a bit more rational to give people the option of bringing their own glasses and paying less than they would if they don't bring their own glasses. Pushing a "free" pair on you, which you know you're paying for somewhere within the system, when you already have a pair in your pocket doesn't make a whole lot of sense. But psychologically, this is happening at the worst possible time. Theaters that have already paid big money to convert screens to 3-D are seeing the return on that investment drop precipitously and they're reading articles speculating that a technology into which they sank money only a couple of years back may already be dead. Not ho-hum, but dead. Some consumers who have seen Avatar and therefore feel like they've gotten what the medium has to offer seem to care less and less about seeing it again — particularly in live-action films like Pirates Of The Caribbean 4 or Green Lantern. Plenty of them actively hate it, including high-profile 3-D adversaries like Roger Ebert. Sure, 3-D got a bump from the huge returns on the re-release of The Lion King, but that's both (1) animation, which has made more impressive use of 3-D than live action has; and (2) a re-release of a beloved Disney film at a time when there's very little else of value around, particularly for kids. The fact that people will pack kids into the car who weren't born when The Lion King came out the first time and treat them to a 3-D showing doesn't mean they're going to pay $4 and pay for plastic glasses just so they can see Men In Black III in 3-D instead of 2-D. But it does seem like a buy-your-own-glasses model could hasten the decline of 3-D for ordinary live-action genre pictures that studios hoped could be broadly produced in 3-D and sold at a sweet premium that would help stop the bleeding from home video and piracy. From a consumer standpoint, it's hard to find a way in which Sony's policy change, if it sticks, doesn't make 3-D less attractive. Yes, you can keep the glasses and bring them back, but they're not going to cut the existing ticket premium for glasses-owning patrons, in all likelihood. They're just going to refrain from charging you an additional buck or two. But if you do need to buy glasses, you may well have to stand in yet another line, which is the last thing people want to do in a place where the line for concessions is always agonizingly slow already. At best, if that's the case, what you'll be told is that they'll be charging even more for 3-D, but hey, you can avoid the new extra charges if you keep your glasses at home somewhere, keep them from getting beat up, remember to bring them with you, and make sure they match the kind of 3-D you happen to be seeing. And, of course, you do the same with the glasses your kids will need. Do that, and you won't have to pay any more for the underwhelming 3-D experience than you're already hesitant to pay now! If you don't want to bother with all that rigmarole, of course, you can always just watch the movie in 2-D and pocket the premium. It seems like a better and better idea, doesn't it?